1) What will the course teach me? This accredited online course will teach you to make your own natural and organic cleansers, toners, moisturizers, creams, lotions, balms, body butters, serums, masks, scrubs and more! For a limited time you’ll also receive 4 free bonus classes with your enrollment. This offer ends of 1st February 2019. 2) How long does it take to finish the class? The Certificate in Making Natural Skincare Products is our shorter beginners’ course. The time it takes to complete the course really depends on how many products you want to make. You can make as many or few as you like! There are nine Modules and you’ll probably need to allow two to four hours per Module to understand the theory, complete the exercises and practice making a few products. There are no live classes; everything is pre-recorded so you can study at a time that is convenient for you. You can work through the course as quickly or slowly as you wish. If you want a longer and more in-depth course then you may wish to consider our Diploma in Natural Skincare Formulation. 3) How much is the course? Do you offer a payment plan? The enrollment fee is US $297. We don’t offer a payment plan for this course. 4) Is the course accredited? 5) When can I enroll? Enrollment is open year-round. However, if you’d like to receive our four special bonus classes for free then you have until 1st February 2019 to enroll. 6) What are the bonus classes and how can I get them? Until 1st February 2019 you’ll receive four bonus classes when you enroll on the Certificate course. Baking soda is an effective, natural ingredient for deodorants because it has a very high pH that prevents bacteria growing and reproducing on our skin as we sweat. The downside of this high pH is it can be irritating for some. This is why in our recipe we added a couple of (secret) ingredients that have a soothing and anti-inflammatory effect on the skin so you can benefit from the effectiveness of baking soda without the irritation! We also include a recipe that uses a completely different deodorizing ingredient so you can steer clear of baking soda! What is it? You’ll have to read the eBook to find out! How to make your deodorants in two formats: a balm and a stick. How to make your deodorant stronger if you wish. Fizzing fairy dust and aromatic bath soaks! Help maintain skin elasticity and integrity. Restore the lipid layer of the skin. Protect the skin cells against photo-oxidative damage. You can only access these four bonus classes when you enroll on the Certificate course by 1st February 2019. Enroll by 1st February to receive 4 free bonus classes! 7) How does studying with you work? You’ll meet your classmates and tutors in our private student support group (hosted in Facebook). There you can chat to other students 24/7 and if you have a question for a tutor you can ask these each Monday on our Q&A post. When you have worked through the lessons you can take the end-of-course quiz. Once you have successfully completed the quiz you’ll be issued with your Certificate of Completion. You can retake the quiz as many times as you need to. 8) What is the format of the course? The course includes a variety of materials: beautifully presented recipes files and written guides, practical video demonstrations, audio lessons, quick reference charts and worksheets. We also include some “Getting to know your carrier oils/essential oils experience weeks” where you’ll get to know these ingredients first hand by experiencing them for yourself. These are live and interactive weeks run by our tutors in our student Facebook group. You also have tutor support available when you need it and you’ll become part of our private student community. 9) How long do I have access to the course? You have access to the course inside the online classroom for 18 months. You can also download and save the documents on your own computer forever. If you want to renew your access to the classroom this is possible for a small renewal fee. 10) Can you go back to view the videos and information after you finish? Yes you can revisit all of the material as often as you like, even after you have finished the course. We recommend that you download the course materials to your own computer so you can use them after your course access has expired. 11) How do I get my certificate? There is a quiz to complete at the end of the course and when you have completed that you receive your certificate by email straight away. You can retake the quiz as many times as you need to. 12) Do you include how to make bath bombs? 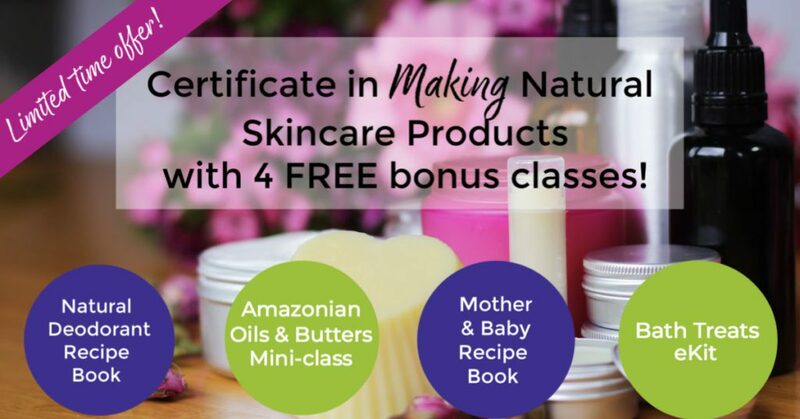 For a limited time we are including our Bath Products eKit as a free bonus when you enroll on the Certificate in Making Natural Skincare Products! This includes how to make bath bombs and much more! This is available until 1st February 2019. 13) What equipment do I need to get started? Some way of creating a double boiler for example jugs/heat-proof beakers and saucepans. 14) What raw materials/ingredients do I need? In terms of ingredients we recommend that you start off simple! With just a handful of ingredients you can make many types of product. We suggest you begin with inexpensive carrier oils that are still very beneficial for the skin. This means as you are practicing and learning you won’t waste expensive ingredients. 2 stabilizers (cetyl alcohol and xanthan gum). 1 wax (beeswax or a vegan alternative). A few basic carrier oils (eg sweet almond, sunflower, apricot kernel). A few specialist carrier oils (eg avocado, macadamia, rosehip, raspberry seed, evening primrose). A few butters (eg shea and cocoa). A few essential oils (the course covers 14 essential oils in depth – you could start with 3-5 of these). There isn’t a set list of materials that you need. We suggest that you read through some of the recipes and decide what you’d like to make. You can also look through the ingredient charts to see which oils sound appealing to you. Then you can order your ingredients accordingly. Don’t get overwhelmed – keep it simple! You can always add more ingredients to your collection later. 15) Where can I buy my ingredients? There are many excellent suppliers of cosmetic ingredients. We provide a very extensive supplier list within our courses that covers suppliers in Australia, New Zealand, Asia, Europe, UK, USA, Canada and more. The Certificate in Making Natural Skincare Products uses easy-to-source ingredients and it’s likely you’ll be able to find what you need in your country. Depending on where you live you may need to order emulsifiers and preservatives from overseas if you wish to use those approved by natural/organic certification bodies. Many suppliers ship internationally. 16) Can I see what other students have said about the Certificate course? Sure! 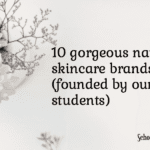 We recently compiled student feedback in this article: What Students Are Saying about the Certificate in Making Natural Skincare Products. 17) Will this course teach me how to start my own skincare brand or formulate products from scratch? No. The Certificate course will teach you how to make products by learning the principles behind each product type and following our recipes (adapting them if you wish). If you want to learn to formulate skincare products from scratch then our Diploma in Natural Skincare Formulation would be a good choice for you. 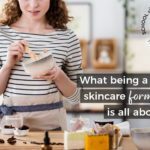 The Certificate course is not designed to help you create your own skincare brand. That’s what we cover step-by-step in our Diploma in Natural Skincare Formulation. The Certificate course can certainly be the first step you take towards starting your own brand or formulating your own products but you will need to complete our Diploma in Natural Skincare Formulation afterwards. 18) How is the Certificate in Making Natural Skincare Products different to the Diploma in Natural Skincare Formulation? The Certificate in Making Natural Skincare Products is our beginners’ course and useful if you want to create products for yourself, family and friends and primarily follow our recipes rather than creating your own. You will gain a good foundational knowledge of different types of products, when and why to use preservatives, emulsifiers and antioxidants and you’ll get lots of recipes to try out. 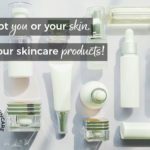 By the end you’ll confidently be creating a range of natural or organic skincare products for face and body including creams and lotions, cleansers, toners, serums, body butters, lotion bars and scrubs. Our Diploma in Natural Skincare Formulation takes your skills to a the next level. This more advanced course will teach you how to formulate your own products from scratch, rather than following our recipes. This means you’ll design a unique product by identifying who the product is for and the benefits you want it to offer. You’ll then use our guides and templates to help you choose your ingredients and create a unique recipe/formula. We cover a wider range of ingredients and also help with business essentials such as creating a brand and selling your products legally. If you want to start a brand or sell your products then the Diploma in Natural Skincare Formulation is designed to help you do that. Many students only take the Certificate course as that helps them achieve their goal of making products for themselves and their friends and family. Many also start with the Certificate course and then move onto the Diploma course to help develop their skills further. Some students who already have some experience with making skincare products only take the Diploma in Natural Skincare Formulation. 19) Can I buy both courses – the Certificate in Making Natural Skincare Products AND the Diploma in Natural Skincare Formulation? Yes you can – and we have a special offer for you if you do! For a limited time when you enroll on the Certificate course you’ll be invited to enroll on the Diploma in Natural Skincare Formulation with a saving of $100 and receive our Guide to Formulating with AHAs and BHAs for FREE! 1) Enroll on the Certificate in Making Natural Skincare Products. 2) Check your emails for the invitation to enroll on the Diploma special offer – but hurry, this will only be available for a limited time! (If you don’t see the email please check your spam/junk folder or contact us at hello@schoolofnaturalskincare.com). Email us at hello@schoolofnaturalskincare.com. We’ll be happy to help.